Larson Electronics lighting equipment for power plants, substations, natural gas plants, and explosion proof certified lighting and electrical supplies and equipment approved for hazardous locations. 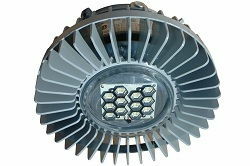 Larson Electronics Power Plant Lighting includes LED lighting systems, fluorescent lighting fixtures, metal halide and HID lights, low voltage lighting and intrinsically safe light fixtures. Larson Electronics power plant lighting is tested and approved by certified organizations such as Underwriters Laboratories and when installed according to relevant hazardous location classifications, provides the quality and protection that industrial and commercial power plant operators require to meet regulatory compliance.